Lay off the sugar already! I don´t want people thinking I have sugar-ladden treats for breakfast, lunch, and dinner… well, not that I´d really mind actually, but since nutrition does have some sort of role in what we eat, I do eat savory things, and sometimes I even feel like posting about it. The problem is that my savory dishes are usually simple and most of the time don´t involve recipes, which gets in the way of blogging about them. But this time, when I was creating these meatballs, I made sure I wrote down every ingredient so I could tell you all about them later. And boy have these babies worked! I used both ground lean beef and ground pork to jack up the flavor a bit, a bit of fresh ginger and black bean-garlic paste to forego my Italian roots for once and dried pepper flakes and rosemary, because… well, it´s not necessary to stray thaaaaaat far from your roots after all. 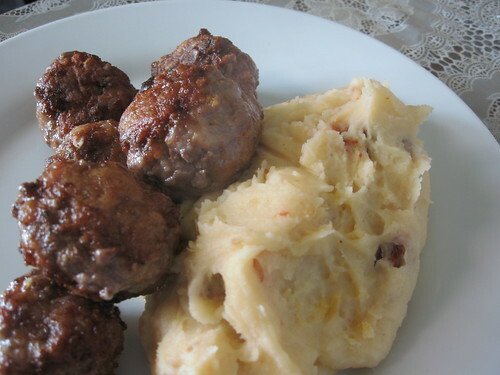 They turned out delicious and surprising, and the recipe yielded quite a bit, so I still have some in the freezer and I´ve already used them in all sorts of dishes. 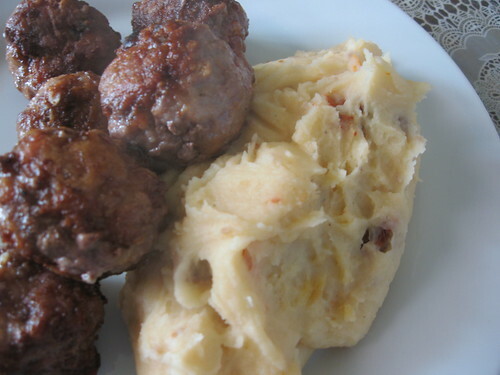 First, I cooked them with a bit of oil in a pan and served them with a side of mashed potatoes with sundried tomatoes. Then, there was a tomato sauce with meatballs with a side of creamy polenta. 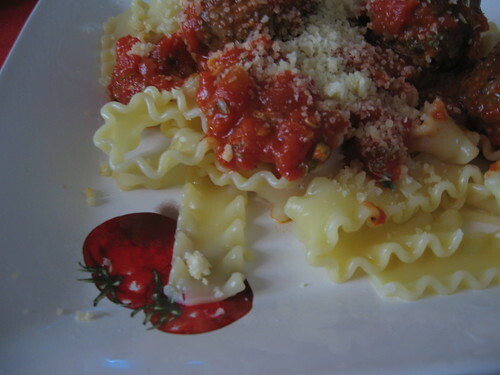 And the last time I made them I just incorporated them into a tomato sauce to go with pasta. You can even make them flat and use them as a different sort of burger. Isn’t it totally lovely when one thing can become several different dishes! Cook once eat three times! That’s appealing to me; especially when it just happens to be super tasty, good plan. Yes, I use my hands as well. 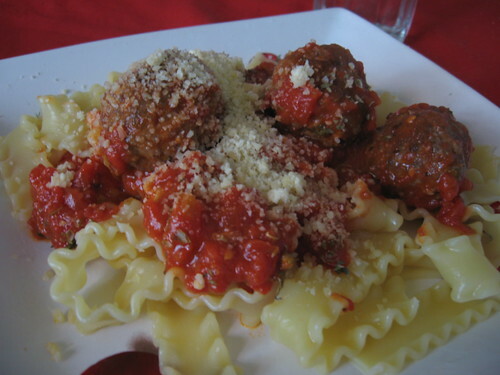 I think I heart meatballs more than any other form of ground meat. There are so many different ways you can make a meatball and 9 out of 10 times they are usually delish. These sound so tasty…I love the sound of this recipe. Its so funny, but I do the same thing…I tend to blog mostly about sweet treats, and forget about or end up not taking the time to blog about dinners and real food…not that sweets aren’t real! 🙂 I cook as much as I bake, but you’d never know it looking at all the cakes and so forth on the blog.